Gantry crane plans with lots of options for height and width. Plans include lots of information with graphs and charts showing engineering options. Make your gantry large or small, from Steel or Aluminum, wide or narrow, heavy duty or light, massive or small. Adjustable legs can be extended for proper height. Build it to fit your needs! Single I-beam design, 8 ft to 30 ft width options. Telescoping legs, 7 ft to 16 ft height options. Options for 1000 lb. to 6000 lb. capacity. Note: Some length and capacity options are mutually exclusive. Options for Steel (stronger) and Aluminum. Spring mount wheel assembly plans are also included. Plans include drawings, instructions, and list of materials. These are excellent gantry crane plans for big lifting and they include lots of options for size and capacity. The crane is height adjustable for ease of use and for disassembly for storage. Best of all . . . You Can Build It Yourself ! Construction requires steel cutting, welding and drilling. Load Capacity is (depending on options) from 1,000 to 6,000 lbs* See notes. Crane capacity is a function of the height, width, and beam options. Plans include several graphs showing the effects of beam type, length and under beam clearance with instructions for choosing. Since these plans cover a wide range of options, prepare for some figuring. You’ll need to know the required load, span width, and how tall (and short) the crane must be. Plans include instructions with lots of illustrations, a List of Materials, and Construction Hints for building the crane.
. . . More on What is in the Plans . . .
To make your lifting chores even easier, check out the accessories! 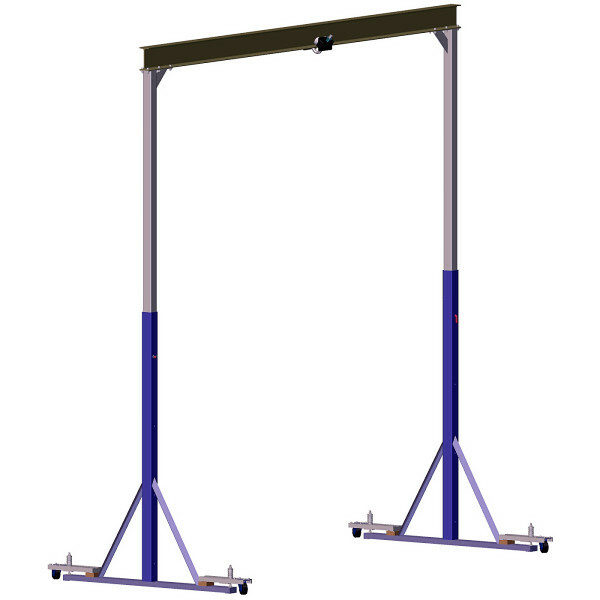 — Our “Winching Pole” & Load Leveler are perfect tools for many gantry cranes. (May not work well with cranes over 10 ft.) The Beam Clamp (Free Plans) can make the crane more flexible for size. (Read the announcement). * Load capacity for the crane is a static vertical load and is highly dependent on materials used, construction techniques, assembly methods and load distribution. Capacity numbers quoted are extremes. Several beam choices are available, including aluminum. Higher (taller) cranes and wider (span) cranes have lower capacity. Load capacity does not compensate for capacities for trolley, cables, chains or other hoist equipment used. Do not exceed manufactures limits. Always use Extreme Caution when lifting. Good planning is the beginning of a successful project. So, Great Plans Are Available Here!